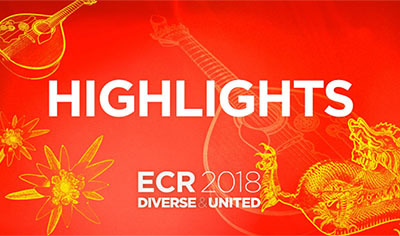 Radiologists, physicists, radiographers and other professionals from all over the world – over 140 countries – and from a diversity of cultures attend the European Congress of Radiology. The ECR is a multi-disciplinary meeting where students shake hands with international experts, medical residents exchange ideas with physicists, and participants share their perspectives with industry representatives. CT during pregnancy: what are the suggested actions for patient dose management? This Special Focus Session has been included as EuroSafe Imaging session. EuroSafe Imaging is the ESR’s flagship initiative in radiation protection. It aims to promote the safe and appropriate use of medical imaging in Europe and around the world. The Physics in Medical Imaging SC organized 5 of the 74 Refresher Courses prepared by the various scientific subcommittees for ECR 2018. Based on the topic of the session, some refresher courses are presented in an ‘integrated’ format with an organised panel discussion, similar to Special Focus Sessions. Panel discussion CT during pregnancy: Are there sufficient benefits of this technique? How to optimise motion management in different imaging modalities? Accepted papers for oral presentation are presented in the 132 Scientific Sessions. Several sessions feature keynote lectures with a concise educational introduction related to the topic. The Physics in Medical Imaging subcommittee received 140 abstracts in total, of which 66 have been accepted (6 scientific sessions). The topics were innovative with a focus on computer applications, neural networks, omics, and included many research abstracts. This workshop is the 20th in the series of EFOMP Workshops on new technology in diagnostic radiology. This year’s workshop is entitled ‘Dose management systems and repositories: the present and the future’. It has been organised by EFOMP in collaboration with the ESR to address the current and future technological requirements for radiology imaging equipment. Imaging and dose repositories: tools to boost radiation protection and research? On Saturday March 3rd at 11:00 until 12:00 in Room M28 - M building there will be a meeting of the joint EFOMP/AAPM new breast dosimetry method Working Group. All interested professionals are welcome to join and be updated on the work that is being done so far and to get feedback on future collaboration.